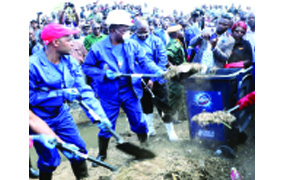 • THE President (centre) takes part in the cleaning exercise during the launch of the ‘Make Zambia clean, green and healthy campain’. WHILE the business community and other stakeholders have hailed the re-launch of “Keep Zambia Clean, Green and Healthy” campaign, the onus is now on the private sector to explore investment opportunities in this untapped industry. Revival of the campaign by President Edgar Lungu in Lusaka recently, puts to the test the ability of the private sector as well as local authorities to enhance service delivery by developing garbage collection as a big business venture. It is evident that outbreaks of water borne diseases such as cholera and dysentery among others, is largely caused by untidy surroundings which have characterised most Zambian cities and towns today. According to the Waste Management Unit (WMU), Zambia generates close to three million tonnes of solid wastes per year with Lusaka alone contributing close to 1 million tonnes. Kitwe and Ndola each, generates approximately between 70,000 and 100,000 tonnes of garbage per annum and these figures could be much higher if they include other towns on the Copperbelt. The United Nations (UN) report reveals that the global Municipal solid wastes is estimated at almost 3 billion tonnes per year. This rapid generation of solid wastes poses a great challenge to the local authorities and private entrepreneurs that needs to invest heavily in this sector. Launching this campaign could trigger more investments in the sector that lacks major players to make the cities look much cleaner than they are today. The move will definitely reduce the cost of fighting perennial water borne diseases as well as, resources spent on cleaning cities and towns each time there was an outbreak of such diseases. Minister of Information and Broadcasting Dora Siliya said the idea was to continue to rid the country of dirt in order to avoid diseases such as cholera for instance. Ms Siliya said Government at the beginning of the year spent about K130 million to fight cholera that claimed a number of deaths a large number of which was in Lusaka. “In launching the keep Zambia clean campaign, there will be a provision that every last weekend of each month, is going to be a day for all of us to participate in keeping Zambia clean,” she says. But while this is a good move, there is also need to inculcate a sense of responsibility among citizens especially those who litter surroundings at will. The dawn of disposable plastic and take away breakable bottles including plastic carrier bags, is a real threat to the environment. Steps by the government to ban plastic carrier bags could be one of the ways to reduce environmental degradation. 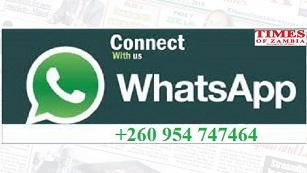 Local Government Minister Vincent Mwale, who said his ministry would work closely with ministries of General Education and that of Religious Affairs to ensure schools and churches were involved, should also fight for more resources to be extended to local authorities to give them capacity to deliver. Most local authorities have no capacity to manage waste management challenges more effectively because the Government does not fund them regularly. There should be a provision in the national budget to fund Local councils around the country massively to enable them procure garbage collection vehicles, graders and engage enough man power to help keep this country clean. Apart from that, there is also need for councils to enforce by-laws that will compel communities, firms and individuals to dispose of rubbish in designated areas. Mr Mwale should keep in mind that councils play a crucial role in ensuring cities remained clean but if they are not well funded for that task, nothing positive will be achieved in this campaign. Perhaps Zambia should take an example of Rwanda which is one of the cleanest countries in Africa. UN Environmental Programme head Eric Solheim during the World Economic Forum in Davos, Switzerland, referred to Kigali as the “cleanest city on the planet” both in terms of lack of rubbish on the streets as well as green initiatives by that country’s government. Kigali residents also have time once every month in which they take their position in cleaning up the environment. For this to succeed in Zambia, it will involve a combination of various government schemes that can make this country’s cities much cleaner than they are now. The local government should also compel business premise owners to ensure that they paint their buildings to make then look clean or face a big fine. Most buildings in Zambia’s cities are dilapidated not talking about the corridor floors which are broken and growing grass. The private sector should also come on board to place litter bins on every street corner and near eating outlets to make people place litter in. In addition to the green initiatives, local councils should endeavour to cut long grass on street corners or eliminate thriving bushes along streets or street islands and even paving some of the street corners or walkways. Kitwe City Council’s initiative to pave walkways is paying dividends as the city is slowly becoming clean again. This is why an environmental expert Kelvin Kangwa is suggesting that a programme to pave some street islands, walkways and street corners including the whole city be embarked on. “The only way to eliminate dirt is to embark on a programme of paving walkways, street corners and even the whole city to avoid the accumulation of bushes especially during the rainy season, this can make the country look cleaner,” Mr Kangwa says. Residential areas and townships have become dirtier than before because garbage is thrown anyhow while part of it is used to mend pot holes in the roads that have remained in bad repair for a long time. Each household should be encouraged to have a dust bin and garbage collection companies, must charge affordable rates if they are to expand their business. The general outlook of surroundings of some residential houses left much to be desired and gone are the days of ZCCM whose mine townships looked neat because of a stiff law on cleanliness that existed then. As President Lungu has urged Zambians to own the initiative, local councils should also apply punitive measures against individuals flouting the law following a new Statutory Instrument (SI) which was recently signed. It is good to hear that Government was currently working towards the enactment of the solid waste management legislation to help keep, maintain and sustain the environment. This is the time the private sector like Trade Kings for example, to think of investing heavily in garbage collection and other cleaning initiatives if this campaign is to succeed. Creating a national recycling and waste management company could also be one of the prefect answers not only to maintaining a clean Zambia, but also to the creation of thousands of jobs for cleaners, street sweepers, rubbish collectors and green park attendants among them. There should be a blue print on how this exercise could be sustainable and how communities could be drawn into the whole programme. It should take a well-coordinated and strong political will to make this campaign a reality otherwise, there will be another re-launch because the first and second will have lamentably failed and then, it will become a trend for every successive political leadership to launch and re-launch it over and over again.